Sunderland XI: Mannone, Jones, van Aanholt, O'Shea, Brown, Cattermole, M'Vila, Johnson, Borini, Watmore, Defoe. Huge win for Sunderland as they boost their survival hopes. It doesn't look good for rock-bottom Aston Villa. You can follow all the reaction here. Ola Toivonen cuts back for Jermain Defoe who slams home. Horrible Villa defending. Four minutes of injury time. Sunderland are not making this easy for themselves. They keep giving the ball away... but are getting away with it. Danny Graham is almost in. He takes the ball down inside the penalty area but, just before he shoots, Leandro Bacuna gets his toe in and pokes the ball away. BBC Newcastle's SAFC summariser Gary Bennett: "That was a goal of a top striker. Great touch on his weaker side. He shifted the ball and made half a yard for himself. A great finish by Defoe." Adama Traore does a few step over on the right.... The cross is hopeless. Aston Villa are still fighting. This could be a nervy last 10 minutes. As results stand, Aston Villa drop 12 points adrift of safety. Sunderland move to within five points of the safety zone. A long ball is punted towards Jermain Defoe on the edge of the penalty area. The Sunderland striker takes it down well, beats Joleon Lescott and fires home at the near post. A half chance for Jermain Defoe. Billy Jones sends in a decent cross from the right but Defoe and Fabio Borini both miss the ball as it runs to goalkeeper Brad Guzan. BBC Newcastle's SAFC summariser Gary Bennett: "What was Fabio Borini doing? He lost the ball when all he had to do was keep it simple. We've not recovered. It allowed Villa to break, but what a volley from Gil." Patrick Van Aanholt bids to whip up the home fans as his low volleyed cross is cleared for a corner. The Sunderland fans remain stunned. They are in trouble. Adama Traore does well on the right and his deep cross is acrobatically volleyed into the top corner over his own shoulder by Carles Gil. Patrick Van Aanholt again gets bags of space on the left, he moves forward, and drills a shot just wide of the post. Great effort. Almost a second for Sunderland. Jermain Defoe goes through on goal, cuts back, and sees a low shot well saved by goalkeeper Brad Guzan. The hard-working Duncan Watmore is replaced by fellow forward Danny Graham. Like-for-like. For Aston Villa, Jack Grealish is replaced by Adama Traore in midfield. Grealish has done very little. Sunderland still lacking any intent going forward but you can't help wondering where Aston Villa are going to get an equaliser from. Half chance for Jermain Defoe. He twists and turns on the edge of the penalty area but his shot is blocked. Carles Gil races down the right and curls in a decent cross towards Rudy Gestede. Sunderland clear. Sunderland shout for a penalty as Adam Johnson's free-kick hits Idrissa Gueye on the top of the shoulder. Back under way at the Stadium of Light. What have Aston Villa got left? BBC Newcastle's SAFC summariser Gary Bennett: "Sam Allardyce will be happy with the first half. Sunderland have got their noses in front. They got the goal through a little bit of luck, but you make your own luck in this game." Patrick van Aanholt takes a few steps back.... runs forward.... but bends the shots wide. Sunderland are finally enjoying more of the ball. A free-kick 25 yards out after Billy Jones is tumbled by Leandro Barcuna. Chance? It was against the run of play, but Patrick van Aanholt's opener against Aston Villa was a well-worked goal, with a massive deflection at the end - not shown below. Duncan Watmore is Sunderland's one bright light going forward. Every time the young striker gets the ball, he looks to drive towards goal. Direct stuff. Sunderland won't quite know how they are ahead. Their possession has been awful, they have been virtually non existent as an attacking force but, if this stays the same, they won't care. For all Villa's possession, they do lack a cutting edge. BBC Newcastle's SAFC summariser Gary Bennett: "Now they've taken the lead, this is where Sunderland have got to get it together again and calm things down. They've got their noses in front when Villa were in the ascendancy. Aston Villa are still the team coming forward but where are the goals going to come from? Rudy Gestede's looping header is very easy for goalkeeper Vito Mannone. The Sunderland fans are a lot happier now. Patrick van Aanholt drives forward on the left, unleashes a low shot, which deflects off Micah Richards and trickles into the net. Against the run of play. The Sunderland fans are getting very, very restless. Their team are just kicking the ball back to Aston Villa every time they get it. It has been shocking stuff from the hosts. Sunderland boss Sam Allardyce does not look a happy man. He is chewing away furiously on a bit of gum as his side continue to give the ball away cheaply. Villa will be very encouraged. This match is certainly lacking quality at the moment. 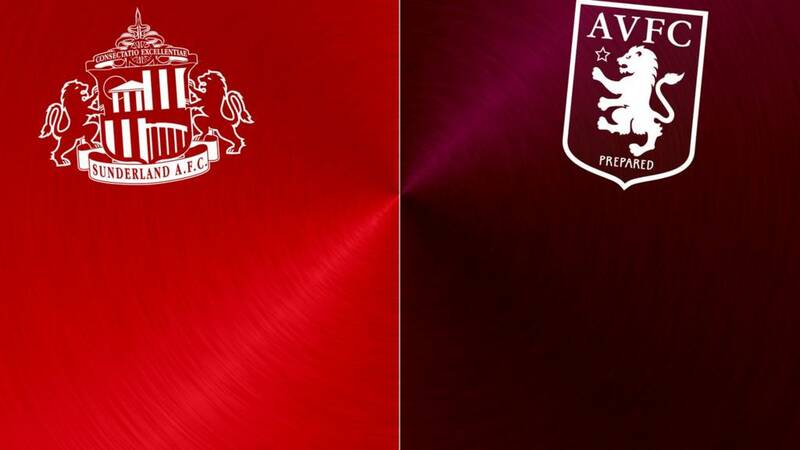 Aston Villa looking the more dangerous but little to show from either side. Comes to nothing as Adam Johnson's floated delivery is headed tamely over by Fabio Borini. Fabio Borini is furious he doesn't get a free-kick on the edge of the area, after a tussle with Micah Richards. Play is waved on though and Duncan Watmore latches onto the loose ball and strikes straight at Brad Guzan. Sunderland are looking very vulnerable at the back. Rudy Gestede is dominating aerially for the Villains, while Jordan Veretout and Leandro Bacuna are getting forward well on the flanks. Plenty of mistakes from both sides. Leandro Bacuna is having a field day. The midfielder again gets free, drives down the right, and his deep cross finds Jordan Veretout, whose low volley is well palmed away by Sunderland stopper Vito Mannone. First, Lee Cattermole gifts Leandro Bacuna possession on the edge of the halfway line. The midfielder drives forward but again shoots wide. Aston Villa's first threat of the match as Leandro Bacuna nips inside and curls a shot just wide. Sam Allardyce described this match as the biggest of the season and his Sunderland side have responded early on. A high tempo and they go close as Duncan Watmore latches onto Fabio Borini's back heel but blazes over from the edge of the penalty area. If Sunderland or Aston Villa are going to still be in the Premier League next season, they need to get motoring. Surely neither can afford to lose this? Under way. A glance at the Premier League table and things don't look great for either. Aston Villa are marooned at the bottom on just eight points and without a league win in 17 league matches. 'Dance of the Knights' from Prokofiev's ballet is played over the tannoy as they emerge into a very wet arena. "While survival seems a long way off for both, the loser of this game will surely start to feel even more desperate. "Putting the "six pointer" clichés to one side, the fact is that Sunderland and Villa each probably need a further 10 wins from their remaining 19 games and this fixture will have been targeted by both clubs as the first of them. "Though the Black Cats' almost annual surge for safety means their supporters will be more used to this predicament than most, even their patience will wear thin if they don't beat Villa. "And while you get the sense the visitors have begun to resign themselves to their fate, victory at the Stadium Of Light will at least allow them to ponder those 'you never know' feelings." Quote Message: I don't see any goals in this Aston Villa team. Where are they going to come from? If Villa do make any signings in January, I would suggest they are with one eye on the Championship as well." I don't see any goals in this Aston Villa team. Where are they going to come from? If Villa do make any signings in January, I would suggest they are with one eye on the Championship as well." Quote Message: This a massive game for Sunderland - a must-win game. Not just about points but in terms of confidence and belief too. Villa are cut adrift and it looks as though they are going to go down. But Sunderland need a result this weekend just to give everyone a bit of a lift. If they get beat or even draw then it's going to be very difficult for them." This a massive game for Sunderland - a must-win game. Not just about points but in terms of confidence and belief too. Villa are cut adrift and it looks as though they are going to go down. But Sunderland need a result this weekend just to give everyone a bit of a lift. If they get beat or even draw then it's going to be very difficult for them." Sunderland's Younes Kaboul is out injured but fellow defenders John O'Shea and Wes Brown are in the starting XI after injury scares this week. Striker Duncan Watmore comes into the side in a three-pronged attack. Aston Villa boss Remi Garde makes five changes from the side that lost to Norwich City for the clash against Sunderland. Jordan Ayew and Ashley Westwood serve one-game bans while Jack Grealish - his first start since early December - and Rudy Gestede come into the starting line-up in attack. It was a pretty miserable end to 2015 for both Sunderland and Aston Villa. They could have a tough start to 2016 ahead. Live coverage of a massive relegation tussle here. "The biggest game of the season". That is what Sunderland boss Sam Allardyce thinks about today. You can see why - this is huge for both.